Did you know that bird watching is the second largest hobby? I knew it was a popular hobby but didn't have a clue it was that popular. After our last field trip I can understand why. They are so captivating to watch and to learn about. In between the used curriculum sale and working on updating our New Beginnings program, we managed to squeeze in our group's last field trip for the year which was a bird presentation given by the Houston Audubon Society. The visuals she used in the presentation from the beginning to end kept our kids asking SOOO many questions. as bringing out a peregrine falcon. We didn't have to remind any of the kids to listen up. The kids were just as curious about the horned owl as he was to look at. I don't know if you can see real good what she is holding in her hands but it is a hummingbird and a nest. I have seen many hummingbirds but have never seen a nest. She even brought different types of feathers for a hands on touch and see. that we could get a closer look and touch. What a way to end our field trips for this year. After my youngest son saw this, he just had to have a bird log. 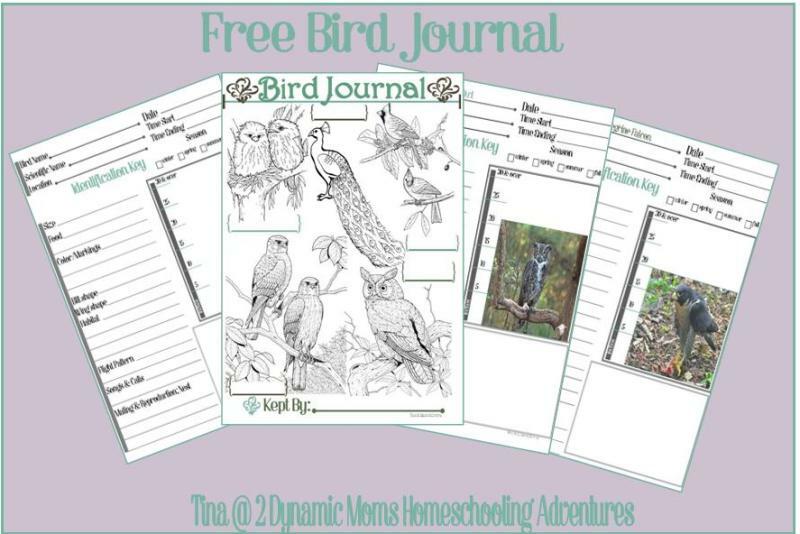 I have a free falcon lapbook on my Dynamic 2 Moms and now I created a Bird Journal that can be used on any unit or to use by itself. I have one cover and one blank page that will allow your child to draw in or sketch the bird and then add some facts. I added one extra box on the page so that you can use it how you want to. You can have your child draw a nest or baby chick if they are younger or if they are older they can write about a fact they enjoyed learning about the bird. Also, I have created a page for the peregrine falcon and horned owl with the picture already added. You know how I like to have many projects moving ahead slowly. So this will allow me to keep adding pages to this bird journal. If your child wants to learn about a particular bird, just glue that picture in or draw the bird in the page left blank. If not, I will add to this bird journal with different birds pictures in color and you can add it to your journal as I complete them. My son wants to use some of my pictures and draw in some birds of his own choosing. Download below by clicking on each link. I was thinking about this quote today because I do a lot of reflecting at this time of the year. I think about people whose path cross mine in homeschooling, like yours and think how much better I am knowing you. Homeschooling is about growing, learning, failing and moving ahead in spite of those failures...homeschooling is about the people and building friendships along the way. Just wanted to say Thank You for being here and crossing my path.